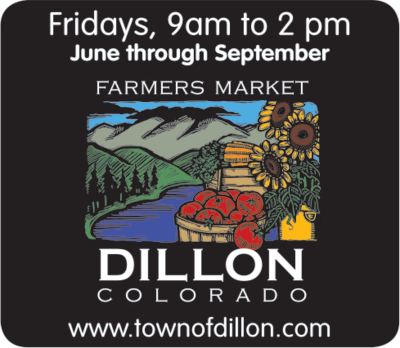 This year the Dillon Farmers Market opens Friday, June 6 from 9am-2pm. Then the Dillon Farmer’s Market will open ever Friday from 9am-2pm all throughout the summer. What’s really cool is that it’s just 5 minutes from the Ski Silverthorne.com Lodge. Vendors have stands full of fresh fruits & vegetables, bread, salmon, meat, cheeses & organic jelly, ready for you to buy. You can even sample most foods before you buy them. We love getting the fresh organic cherries and then eating them while we walk up & down the street. Some of the plumpest and reddest tomatoes you will find can be gotten at the Dillon Farmer’s Market. We came home, cut them up & ate 2 that afternoon w/ some salt & pepper cracked on top- so delicious! They are almost so good that they need to be eaten by themselves. Cooking them must wouldn’t do them justice. We also bought the Asagio cheese bread, made fresh that day! We tasted several samples of true goat cheese, we bought one that was flavored with?? It was so good with some wheat thin crackers later that week. There are vendors at the Dillon Farmer’s Market selling their works of art, jewelry, clothes, scarves & soap that they have made themselves. You will see original works of art & food that you can not find any where else. The kids will have a great time seeing the sights. Vendors paint faces, doing juggling acts & riding unicycles. There is live music playing over the loud speakers, which helps to keep you in the shopping mood. Vendors are selling lemonade, cotton candy, popcorn, hot dogs & all other sorts of goodies that the kids will want you to buy. For the adults, there is homemade tamales, BBQ, gyros, polish sausages & many more choices. You can eat on the picnic tables at the open field & park area right behind the vendor booths. The kids can run around to let out some energy or even walk about 200 yards to a playground area. It doesn’t really get above 70®F in Dillon during the summer time – the air is usually cool and dry.